NWO-I, the Institutes Organisation of NWO, is fully named the Netherlands Foundation of Scientific Research Institutes. NWO-I is an independent foundation, that belongs to the Netherlands Organisation for Scientific Research (NWO). NWO-I is located on the Van Vollenhovenlaan in Utrecht. Read more about the NWO Transition. 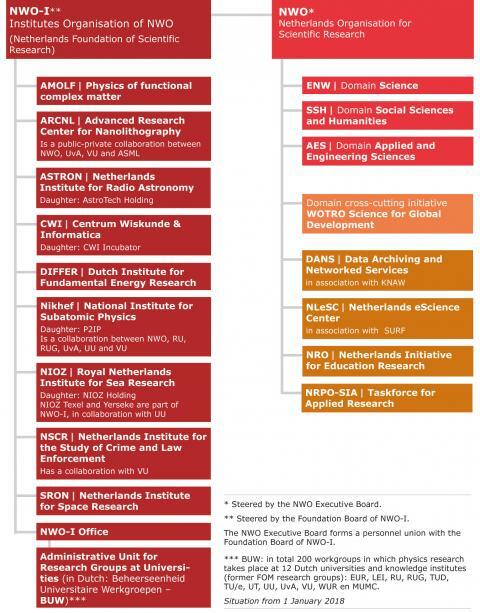 200 workgroups are part of NWO-I (BUW: Beheerseenheid Universitaire Werkgroepen), where physics research takes place at Dutch universities and institutes (see list below). This research will take place untill the former FOM-projects have been seen to an end. NWO-I spent 117 million Euro's in 2016 for exploitation and investment activities. The first source was NWO, and secondary sources were the European Union, the Dutch Government and cooperation with universities and businesses. At the end of 2016 the staff consisted of 66 tenured scientific employees, 185 postdocs, 478 PhD researchers and 356 technicians and other employees. These employees produced in 2016 104 theses, 1.238 refereed scientific publications, around 1.500 other publications and 11 patents. All granting information on this NWO-I-website belongs to the NWO Domain Science. In a while this information will be published on the NWO website. For more information, please see www.fom.nl/transition, or visit the NWO website.